Judgement MMA Head Coach Scott Marlowe will have four fighters in action this Saturday night inside the Crowne Plaza Hotel in Albuquerque, NM. Rio Rancho’s Judgement MMA possesses a plethora of talent within the confines of their martial arts gym. From the successful MMA fighter Adrian Cruz to the once Olympic Qualifier in Jiu Jitsu Rich Chavez, the gyms roster is loaded with talent of all levels from the upstart amateurs to the established veterans. The Judgement MMA gym is often represented in abundance for the King of the Cage promotion and this Saturday night’s event will not be any different. “Future Legends 23” will feature four fighters out of the Rio Rancho gym. Head Coach Scott Marlowe runs a successful model inside his Judgement MMA gym and that has been proven through several fighters; Coach Marlowe has utilized the King of the Cage promotion as a means to showcase his fighters and develop each up the ranks. In the last couple of years, Coach Marlowe brought John Rozema along starting as an amateur and transitioning into a professional where he would start his pro career off successfully. Now, Coach Marlowe will have the opportunity for progressive success with four talented fighters who are each in very different categories. The fight team out of Rio Rancho will be in great attendance on Saturday night. It is well-known that Judgement MMA often brings the largest…. and loudest fan section. Do not let the record fool you, Shannon Curlee (0-3) is a truly talented amateur mixed martial artist. A Black Belt in Brazilian Jiu Jitsu, Curlee has several valuable years of combat sports experience and acts as a Coach and Mentor to his teammates at Judgement MMA. Curlee equips his MMA toolbag with solid cardio, a very methodical approach to hand-to-hand combat and elite level grappling skills. As Curlee seeks to obtain his first career amateur victory, expect his work ethic to continue to improve as the hunger to come out of the cage with his hand raised continues to grow. He will head into his bout with Robert Taylor with an experience advantage in terms of cage time and will also almost always hold that advantage in the amateur ranks in terms of time spent perfecting his craft in training. A fighter that Curlee impacts as a mentor of sorts, Carlo Rodriguez (1-0) will be in action Saturday night attempting to continue his success early on in his amateur career. Still a teenager and one fight into his amateur career, Rodriguez made an emphatic statement in his cage debut and will now carry hype and high praise of potential into every bout going forward. Back in February, Rodriguez scored a one-punch knockout 50-seconds into the first round. While Rodriguez hasn’t even logged a full minute of fight time, the skills he was able to showcase in that time frame proved to be enough to impress fight fans in attendance. 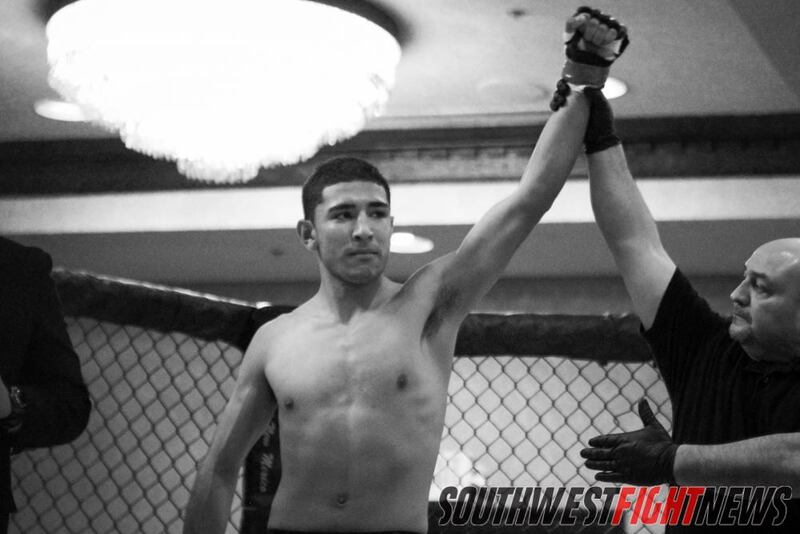 Representing the powerful wave of youth currently flooding into the MMA world, Carlo Rodriguez will be a fighter to keep an eye on come Saturday night. With that endorsement from his Coach, it is easy to understand why the ceiling on Rodriguez’s potential is as high as it is. Rodriguez will take on Mike Silva, a formidable opponent out of El Paso who took Rodriguez’s teammate Jesse Sandoval into deep waters. While the match-up is competitive and of great intrigue, the anticipation of Rodriguez’s sophomore efforts in the cage is high and should definitely be classified as a “must-watch” bout on the fight card. While the future for Papas may not be down a path of cage fighting, his talents are still available to watch for the time-being. Papas is a spark plug and will take on the very successful Joey Trevino on Saturday night. Not only will the fight be an early candidate for “Fight of the Night” but it will be a battle of great intrigue as the methodical Trevino will be countered by the dynamic Papas. The fourth competitor set to represent Judgement MMA also happens to be the newest addition of the group. While Curlee, Rodriguez, and Papas have been long time members of Coach Marlowe’s fight team, James came over recently to improve on his stand-up, an area of expertise for the striking savant in Marlowe. James (5-2) has significant cage experience against very respectable opposition. James has seen action against the current number one contender in the King of the Cage circuit, a current professional fighter and several notable amateur fighters. While James has found submissions to be his “bread and butter”, working with Judgement MMA should make him a threat on the feet as well. James takes on Victor Orquiz of Las Cruces. Orquiz is a striking aficionado and showcased exceptional skills in his last outing; the pairing should give James the opportunity to show off his improving talents and will give one fighter a significant win for their amateur resumes. Stay tuned to Southwest Fight News for more King of the Cage coverage, bout breakdowns and analysis. As always, we encourage the fight fans to show their locals the support they deserve by making their way out to the show. This event is going to sellout which means you better get your tickets now from your favorite fighter or by visiting www.holdmyticket.com.